PAWTUCKET, RI, U.S.A., February 21, 2013: Two PVC elastomer compounds for jacketing of industrial and heavy-duty cables exhibit flexibility even at very low temperatures and provide a property profile comparable to more costly high-performance materials widely used in such applications, it was announced today by Teknor Apex Company. The new products will be introduced at Interwire 2013 (Booth 406). 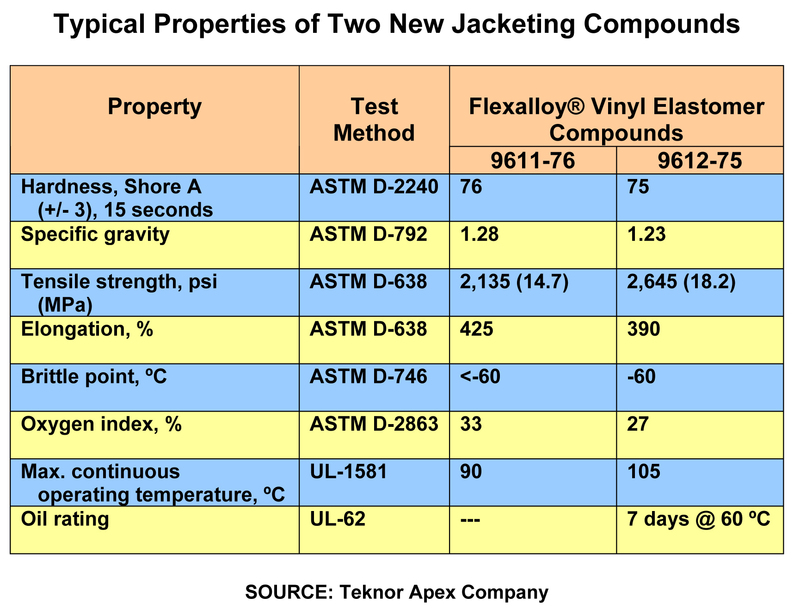 Flexalloy® 9611-76 and 9612-75 compounds exhibit brittle points of -60 ºC or lower and provide the oil resistance, flame retardance, and wide range of operating temperatures required in such applications as control and instrumentation cables (Type CIC), tray cables (TC), and specialty power cords like those for charging electric vehicles. 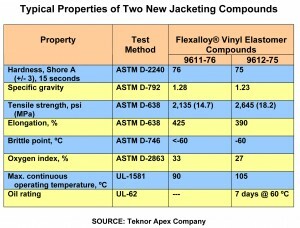 The new compounds have property profiles that compare well with those of the rubber, thermoplastic polyurethane (TPU), and other high-performance thermoplastic elastomers (TPEs) used in these cables, yet they are more cost-effective, according to Mike Patel, industry manager for the Vinyl Division of Teknor Apex. Flexalloy vinyl elastomers are proprietary formulations that provide the elasticity and low-temperature toughness of TPEs, plus PVC benefits like flame retardancy.